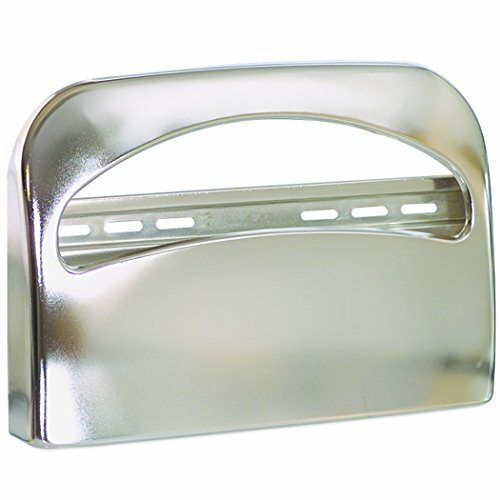 Georgia-Pacific 57725 Safe-T-Gard 1/2 Fold Toilet Seat Cover Dispenser, Chrome by Georgia-Pacific at In The National Interest. MPN: 57725. Hurry! Limited time offer. Offer valid only while supplies last. Our Safe-T-Gard seat cover dispensing system solution delivers clean, white seat covers for increased protection against germs at an economical cost. Our Safe-T-Gard seat cover dispensing system solution delivers clean, white seat covers for increased protection against germs at an economical cost. Our quality seat covers provide a low-cost alternative to wasteful makeshift seat covers comprising of expensive tissue paper and/or towels prepared by patrons when real seat covers are not provided. Furthermore, they reduce labor and maintenance costs associated with system clogs and restroom litter. Offer your patrons the protection and convenience of easy-to-dispense, sanitary seat covers with these durable metal dispensers. View More In Toilet Tissue Dispensers.